The Glacier Creek Cabin - currently sleeps up to 6 (STRICTLY ENFORCED) Tasteful decor and layout. 2 bed/2 bath. 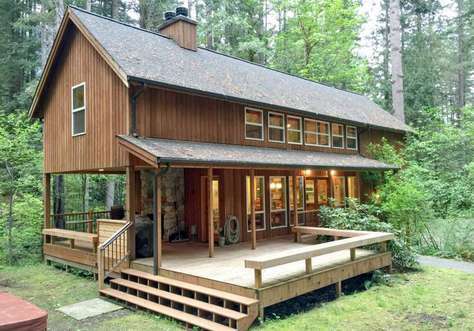 This cozy cabin is perfect for a smaller group, or family with kids. King Bedroom upstairs with full bath, and a queen bedroom and common bath downstairs. A Pullout Queen Sofa in the Living Room.A 50" 4k Smart TV /DVD/ Blue Ray supports Hulu & Netflix on your account. Assorted DVD Collection. Old School Nintendo Wii, assorted board games and Ping Pong! Wood burning Stove (wood provided), All new Modern Furniture, and stainless steel appliances (refrigerator, dishwasher, gas stove, microwave).A Keurig coffee maker is also provided for your coffee needs! New Full Size W & D. Ping Pong Table in the garage, Ready for your Mt Baker Experience! Just 25 minutes to the ski area,. Relax in the Hot Tub after a long day on the mountain. Short walk to the River. 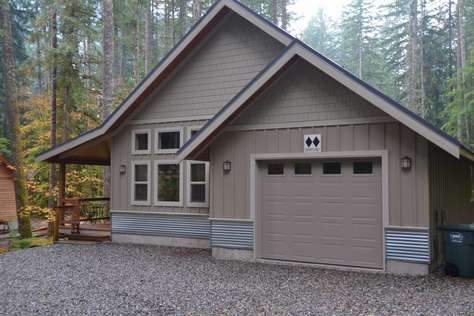 The Boulder Cabin - Sleeps 6-10 (STRICTLY ENFORCED) This comfortable well laid out cabin has 3 beds/2 baths,with plenty of seperate sleeping areas. Living Room (with pullout sofa) features a large flatscreen TV/DVD player (movie collection & games) Fully stocked bright and airy chefs kitchen with gas stove, DW, microwave,coffee maker, grinder, espresso machine, electric tea kettle, crockpot, blender, and a variety of cookware. Beer/Wine Fridge (bartending area) Newer fullsize stackable W/D off kitchen. Kitchen counter opens to the dining room (table & bar seat up to 10) with a cozy free stainding gas stove. Downstairs bedroom has a fullsize sofa/bed with a flatscreen TV & DVD player. Main Level bathroom has shower/tub with lockable entry door to the hot tub. . Queen & full bedrooms upstairs with a large pullout sofa in the loft area. Upstairs bathroom shower features a Rain Shower Headl You can hear the river from the covered front porch. Large Sundance Hot Tub in the back, and a Weber Gas BBQ. Seasonal Firepit. Peek-a-boo view of Church Mountain. Short walk to the Nooksack River. Enjoy biking, waking your dog or just RELAX! ** NOTE – SAME AND NEXT DAY online bookings are not secured unless confirmed by MBVR. 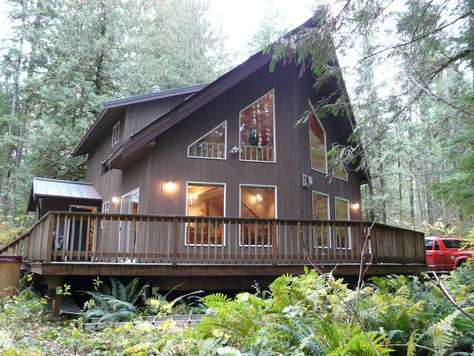 The Baker Lodge - Sleeps 10-11 (STRICTLY ENFORCED) Huge Home(3,000sf) with space for everyone! The Baker Lodge is a well loved, low key, comfortable, Pet Friendly home. Large common area on the main floor, features an open basic equipped kitchen, and a cooking island,for the mountain chef. The dining table seats 6 + and the counter seats 4-5. Full size washer/dryer located off the kitchen. New 48" flat screen TV/DVD,with Roku! A large comfy sectional sofa for movie night, and a wood burning fireplace. (some firewood is supplied) There is a 3/4 bath on the main floor, with a bathtub. Off the dining area is a large deck (partly covered with New Gas BBQ), and a view of the seasonal creek. Hot Tub. Second floor features a King Master Suite, Two Queen Bedrooms and a common full bath. Saving the best for last is the "Kids Lodge Master Suite", located off the main floor (above the garage is the room where the kids are hanging out after a long day on the mountain! This room features a King Size bed,a set of bunks with a single on top and double on the bottom.This awesome room features a FoosBall table, TV/DVD/VHS and a table for board games, etc. Separate Bathroom/Shower also. The UNHEATED garage has an Air Hockey table, and lounge area. 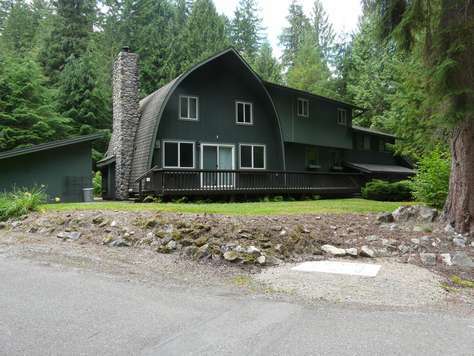 The Baker Lodge is a short walk to the North Fork of the Nooksack River. The Snowline Community offers a seasonal pool (Memorial Day-Labor Day), tennis courts, children’s fishing pond, swings, slide, jungle gym, and picnic table/bench, basketball courts, softball field, pickle ball, court, volleyball/badminton area, and much more. Wifi available at the clubhouse! 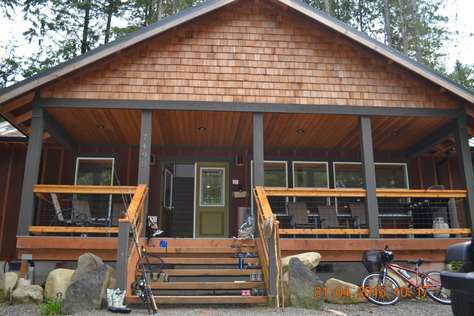 The 542 Cabin - Sleeps 6-8 (STRICTLY ENFORCED) Woodsy 3 bedroom/2 bath + Loft cabin is well designed and completely furnished. King & Queen bedrooms upstairs. *Queen bedroom downstairs (separated with a privacy curtain). 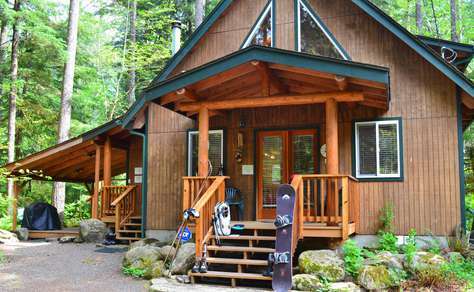 This cozy cabin is ready for your Mt Baker Experience! Just 20-25 minutes to the ski area, located between Glacier and Maple Falls. Covered Deck with Hot Tub! Gas BBQ and fire pit (BYOW). Short walk to the River. Moose Lodge Condo - Mountain Style! 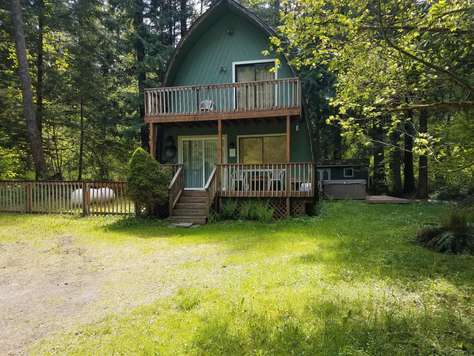 Located in Snowater - Sleeps 2-4 (STRICTLY ENFORCED) This one bedroom/1bath will appointed condo is perfect for a cozy winter or summer getaway. Great for Couples or up to 4 friends. The Moose Lodge Condo has everything you need, all bedding & linens are supplied. Furnished kitchen with dishwasher & Microwave. Living Room features a Queen Pullout Sofa, Gas Fireplace, MP3 Docking Station, Flat Screen TV w/ DVD’s (no cable or satellite). 2 Community Pools & Hot Tubs! Free Wi-Fi available at the Moose Lodge and both clubhouses * not responsible for any down times. Outdoor tennis court, and children's play area. The Snowater Community is located directly adjacent to the Mt. Baker-Snoqualmie National Forest. 20-25 minutes to the Mt. Baker ski area. ** NOTE – SAME AND NEXT DAY online bookings are not secured unless confirmed with Mt. Baker Vacation Rentals, either by phone or e-mail. Please call (360) 671-5383 for more information. Thank you! 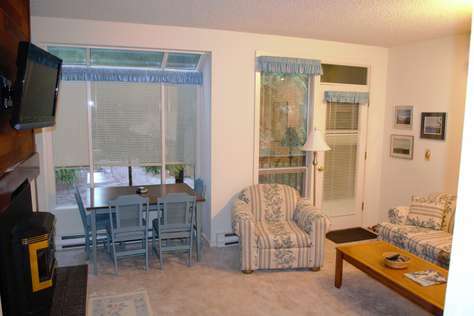 Located in Snowater - Sleeps 2-4 (STRICTLY ENFORCED) Bright Lower Unit - One bedroom/1bath condo is perfect for a cozy winter or summer getaway. Great for 2 couples or up to 4 friends. The community is located directly adjacent to the Mt. Baker-Snoqualmie National Forest. 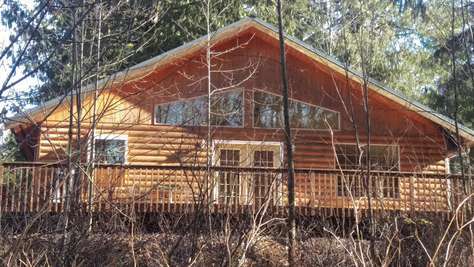 Walking distance to Chair 9 Restaurant & Bar, the Nooksack River & kids play area! The Lone Jack Condo provides all bedding & linens. Pellet Stove (pellets provided) offers wood heat comfort! Microwave, toaster, coffee maker, rice cooker & more. TV w/ DVD/VHS Player (no cable or satellite). Secure Ski/Snowboard gear locker. The community amenities available for your use include: Hot Tubs, Swimming Pools, Kid’s Corner (play areas), Play Field & Tennis Courts. Free Wi-Fi available at both clubhouses * not responsible for any down times. 20-25 minutes to the Mt. Baker ski area.